As every fan will be well aware of by now, Wednesday brought the sad news that Danny Fiszman had lost his long term battle against throat cancer. He was 66 years old. Having watched my own grandfather change immeasurably whilst battling the same illness 3 years ago, I’m sure I would not be alone in hoping Danny passed away in as little pain as possible. There have been many glowing recollections of Danny from senior figures at the club and journalists across the world press. All speak of a man who was dedicated to his family, his friends and his football club...our football club that we shared a common affection for (even when they can’t beat Blackburn at home). Danny worked tirelessly to ensure his cub was in good hands until the end, with Sunday’s news of Stan’s takeover making absolute sense now. Danny knew what was coming, and he didn’t want anything to happen to his club...our club. The club renaming both bridges in recognition of his work, along with the work of Ken Friar, on Thursday will no doubt be one of many fitting tributes to come for a man many have described as a gentleman. Many will be surprised to hear that Danny was one of us, a fan that grew up watching the club from the stands. He stood on the old clock end back at Highbury as a kid, made a success of his diamond business in adult life and bought into the club he loved in the early 1990s. He later sold his business to focus solely on Arsenal. From that point on he was able to help transform the club so much. Just look at the ground we play in now, that many have rightly pointed out is his legacy. That is how I will remember him too, as a fan who wanted the best for his club and his fellow supporters. I remember being horrified at the thought of playing at Kings Cross / Wembley. As news emerged that a site had been found closer to Highbury, my familiarity grew with who Danny was. The TV / news paper interviews came rapidly and he was the face of the mammoth project that has been realised as our new home. I remember the night when Islington council granted planning permission to build the stadium. Outside whatever building held the hearing Danny conducted a TV interview with such massive pride and elation on his face, it was clear to see this was not just another body in a suit looking forward to swelled match day revenues. This was a fan who had just achieved something magical for his club, for our club. Before every home game I would stare through the wire fence as our new stadium rose. Updates would come from Danny via the media and he, like us, shared in the excitement. 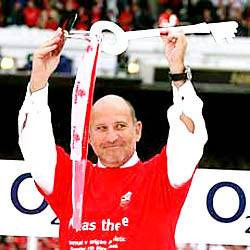 I remember him at Highbury on the last game day, waving from the director’s box with one of those I WAS THERE t-shirts on, and wearing it with pride. I remember him flying all of our French players on international duty back from Slovenia on his private jet so they could be back in London ASAP for the next game. From what I’ve been able to find on the web too Danny paid the transfer fee of £7.5 million for some Dutch guy called Dennis Bergkamp as well in 1996. I guess in hindsight you could say thanks to him for that too. We’ve lost one of us this week, but hopefully we’ve gained the next visionary in Stan K. Danny was part of the group that pulled this club to the top table of world football in the 20th century. Hopefully the new team that Ivan Gazidis and Stan will build will help us take that next step again in the 21st century to the head of that table. Keep the faith Gooners, Arsene knows.